Antibacterial soap has been around for 40 years. But research now shows that the active ingredient in the soap, triclosan, alters hormonal balance in animals, is possibly harmful to the immune system, and possibly contributes to the rise of antibiotic resistant germs. I’ll give you a moment to dump all your triclosan-containing antibacterial liquid soaps and body washes that you’ve been using for years into the trash. Triclosan, which kills both bacteria and fungus, is found in about 75 percent of antibacterial products. In addition to soaps, it’s found in deodorants and toothpaste and mouthwashes where it helps prevent gingivitis, and it’s infused in various household products such as garbage bags, kitchen utensils, furniture, clothing, toys, and some cosmetics. In short, triclosan is all around us. Which is why it’s a good thing that the FDA has decided to take a look at the compound to see first of all if it actually works, and secondly if it’s harmful. The move has been prompted by recent animal studies showing triclosan affects hormone regulation in animals. If the same holds for humans, it could increase risk of hormone-related problems such as infertility and early puberty. And a possibly dangerous one. But how could a chemical that has been in everyday household products since 1972 only now face scrutiny by the FDA? The truth is, many chemicals used in household products have never received an FDA stamp of approval because they were developed decades ago before laws required a scientific review of cleaning ingredients. In 1972 Congress passed a law requiring the FDA to set guidelines for many over-the-counter antibacterial chemicals that manufacturers were to follow. 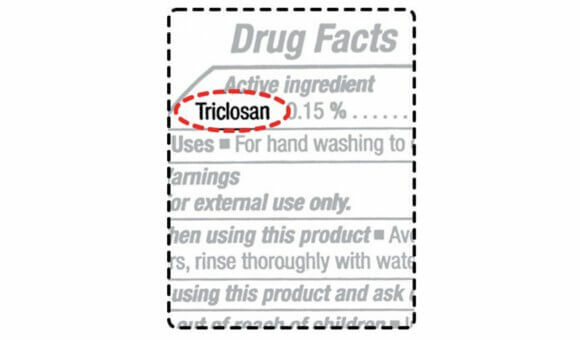 In 1978 the guidelines reflected the FDA’s stance on triclosan as “not generally recognized as safe and effective” because the research scrutinizing its safety and effectiveness was inconclusive. The guidelines, however, were never finalized so companies continued to make products with triclosan. The antibacterial did score a victory in 1997 with its approval for use in Colgate’s Total toothpaste after the Colgate-Palmolive Co. demonstrated it helped prevent gingivitis. For the rest of the products, however, the FDA had set a 2012 deadline for itself to complete its review. At about the time that deadline had come and gone, animal studies emerged showing triclosan to alter hormone regulation and other studies with bacteria indicated that triclosan may increase antibiotics resistance. The hormone study corroborated the results of a 2009 study performed by the Environmental Protection Agency that showed the compound decreased testosterone levels and sperm production in rats and a 2010 study by the University of Florida showing that it interfered with movement of estrogen into fetuses in pregnant sheep. In response to public concern, the FDA issued a consumer update saying they’d finish the review by the end of the year. Some aren’t waiting for the results. The data has prompted some hospitals and companies to stop using products with triclosan. In 2010, Kaiser Permanente replaced triclosan-containing soaps from 37 of its hospitals and replaced them with alcohol-based hand sanitizers. And beginning in 2015, Johnson & Johnson is planning to make all of its adult product triclosan-free. The slow moving FDA certainly isn’t garnering confidence with their unexplained delays. Probably to head off further criticism they haven’t issued another timeframe for the review. When they finally do announce their decision, whatever it is will likely raise the ire of the companies that have to retool entire production lines or consumers won’t believe triclosan is safe no matter what the FDA says. It might get ugly, ugly enough to have to wash people’s mouths out with soap.